As the heroes of the winter game warm up for jump racing’s crowns, Julian Muscat highlights the best days’ racing in the winter calendar. The advent of ‘summer jumping’ has confused the National Hunt season’s narrative, but one constant remains: the best of it gathers pace as the leaves turn. That time is now upon us and, with it, comes a quickening of the pulse. National Hunt racing represents one of the best things about the British winter. Last year’s equine warriors have returned from summer grass to embark on the journey to Cheltenham in March—Sprinter Sacre, sidelined for much of last season with a heart condition, strives to reclaim his mantle as the best steeplechaser in training. It’s a time when hope springs eternal. Much of National Hunt racing’s allure is to be found in its diversity, from the intensity of big-festival competition to the unfettered joy of a regular card in rural surroundings. What binds the sport at all levels is the invigorating sight of horses clearing obstacles at terrifying speed, their jockeys perched like coconuts in a shy, and the camaraderie inherent in any dashing risk sport. It’s an experience that’s inspiring whether it’s at Cheltenham or Catterick. The day that warmly reaffirms hunting and racing’s bond. Terrier racing and rousing hound parades intersperse with the feature race, the spectacular Glenfarclas Cross Country Chase. The Christmas shopping is excellent, the silent auction a field sportsman’s dream and the atmosphere friendly. Tickets from £8 (0844 579 3003; www.cheltenham.co.uk). One of the most enthralling days of the calendar, when London meets Lambourn—the racecourse has its own station on the Paddington line and this is the west Berkshire village’s big day. The sponsor’s product contributes significantly to the atmosphere and the supporting card is excellent, although it’s the feature race that brings the house down. Tickets from £30 (01635 40015; www.racecoursenewbury.co.uk). Brave the claustrophobia at Kempton for the King George Vl if you must, but the regional Boxing Day meetings are arguably more fun. This small West Sussex track offers the perfect antidote to culinary excess and, although the racing is ordinary, that’s not really the point. Decant the children (under 18s go free) and base yourself around a lunch table in the Winter Warmer Lounge. Tickets from £15 (01243 543335; www.fontwellpark.co.uk). Ireland’s Christmas fixture contrives the ideal blend of festive feel with racing for the connoisseur. The craic doesn’t quite fly off the scale, but that’s no bad thing, as you’ll need a clear head to assess the Irish stars as they limber up for Cheltenham in seven Grade 1 races. It’s close enough to Dublin to make a day trip feasible. Tickets from €22 (00 353 1 289 0500; www.leopardstown.com). As a prelude to Cheltenham, take in this rom- antic Somerset beauty spot—champion trainer Paul Nicholls’s local track—where the cosy bars offer shelter from winds whistling over the hilltop and the big race offers pointers to the Champion Hurdle. Tickets from £16 (01963 435840; http://wincanton.thejockeyclub.co.uk). Opening day of the Festival is as good as it gets —a four-day slog through to the Gold Cup can be a hurdle too far. Spirits are high and the noise spine-tingling. Start the day in the lively Guinness Village and go with the flow thereafter. Tickets from £22 (0844 579 3003; www.cheltenham.co.uk). 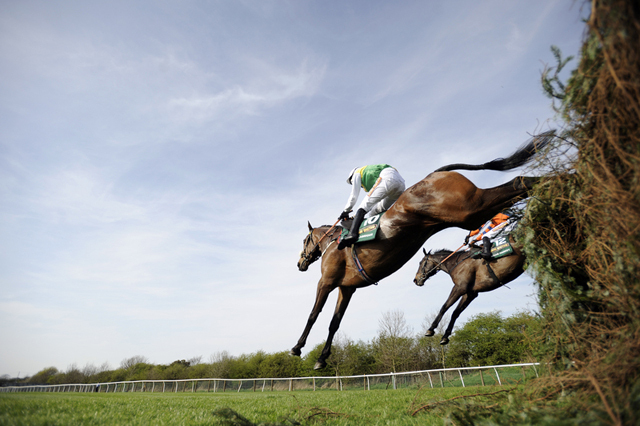 Day two of the Grand National meeting, which includes the Topham over the scary fences, holds particular allure. The big race is imminent, which lends an air of excitement, and it’s Ladies’ Day, when Liverpool lasses flaunt the best and worst of everything. So outrageous are the outfits that Aintree’s executive is introducing a ‘style code’ to stifle excess. Will they heed it? Will they ’eck! This monument to fake tan will proceed unchecked. Tickets from £33.15 (0844 579 3001; http://aintree.thejockeyclub.co.uk). It’s time to wind down. The setting alone, in the grounds of Scone Palace, makes this Scottish outpost a jewel—and the racing’s not bad, either. The Club Restaurant serves a hearty roast. A series of old timber buildings reinforce the impression that time has passed Perth by. Tickets from £18 (01738 551597; www.perth-races.co.uk). An Anglo-Irish rematch, this time on Irish soil, with the gorse-covered Wicklow Hills as backdrop. The schedule includes 12 Grade 1 races and the La Touche Cup over the cross- country course, plus wall-to-wall live music and street theatre. You haven’t lived if you haven’t been. Tickets from €22 (00 353 4589 7704; www.punchestown.com). The homespun face of the sport and a picnicker’s paradise. Normal rules don’t apply, as racing isn’t the main attraction at this Cumbrian venue on Bank Holiday Monday. The event involves the entire village, so much so that the racecourse can’t operate on consecutive days for lack of time to clear up after the last reveller has departed. Ticket prices to be confirmed (01539 536340; www.cartmel-racecourse.co.uk).